Some scans I just got around to. I needed a quick project to take up a few spare minutes last night, so I fixed the broken hinges on my Cox Fuel’N Tool Chest. Looking at the instruction sheet, I figured some others might like to see the instructions. For example, I didn’t know that the two inner-most holes on the Cox handle were supposed to be used for the PT-19. I always used the middle holes. 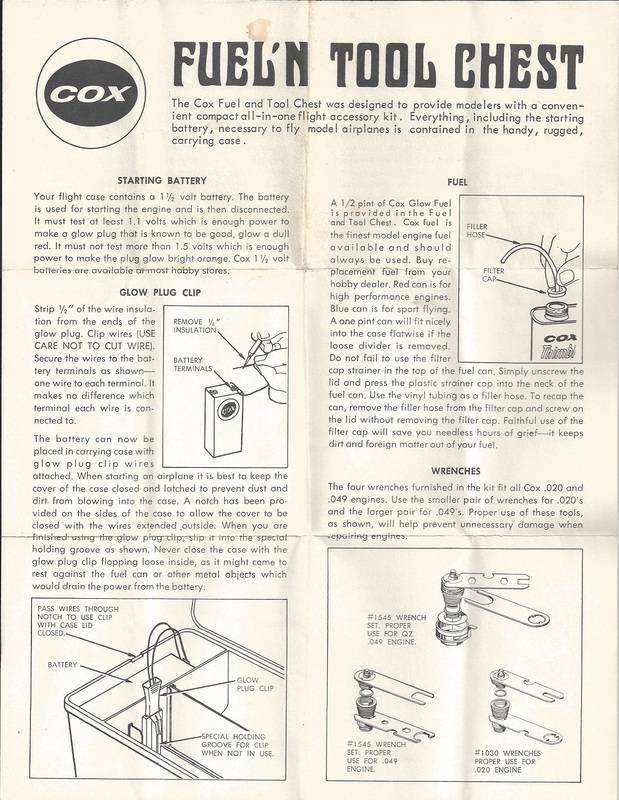 The instructions also have pictures to show the Cox recommended wrenches and how to use them for the .049 and .020 engines. 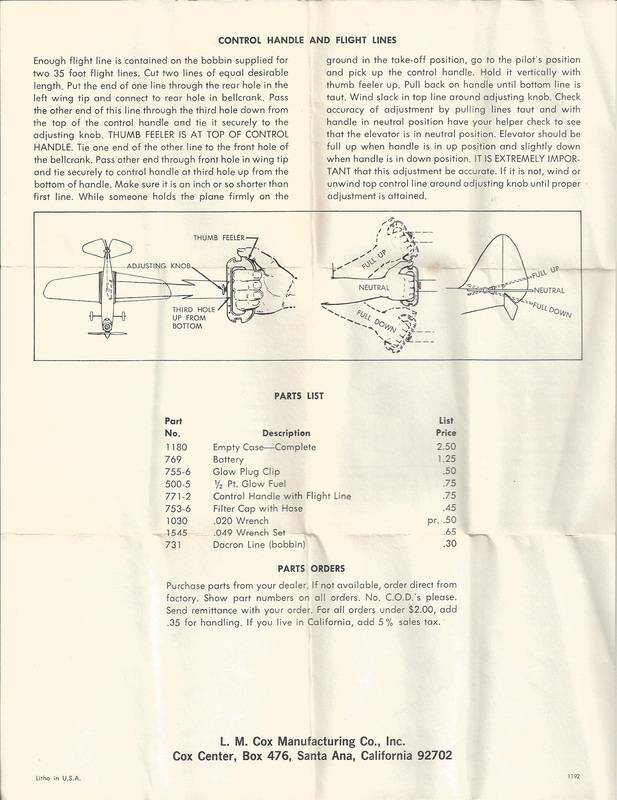 I also wanted to scan the form that used to come with the planes so you could order your Wings like Wally did. Somehow I don’t think if I sent in the 50 cents I’d get a reply. Re: Some scans I just got around to. Thanks Mark, those are very cool! Nice! Do you mind if I add these to the "Instruction Sheets" page? Don't always believe what you read. The wrench instructions shown there is the perfect way to destroy an engine. For those that don't know, don't stick a wrench in the exhaust ports. I have to hand it to Cox, I guess you could say those pictures worked like a marketing tool. Using the wrenches as pictures will either distort or burr the cylinders. Ken Cook wrote: Don't always believe what you read. The wrench instructions shown there is the perfect way to destroy an engine. For those that don't know, don't stick a wrench in the exhaust ports. 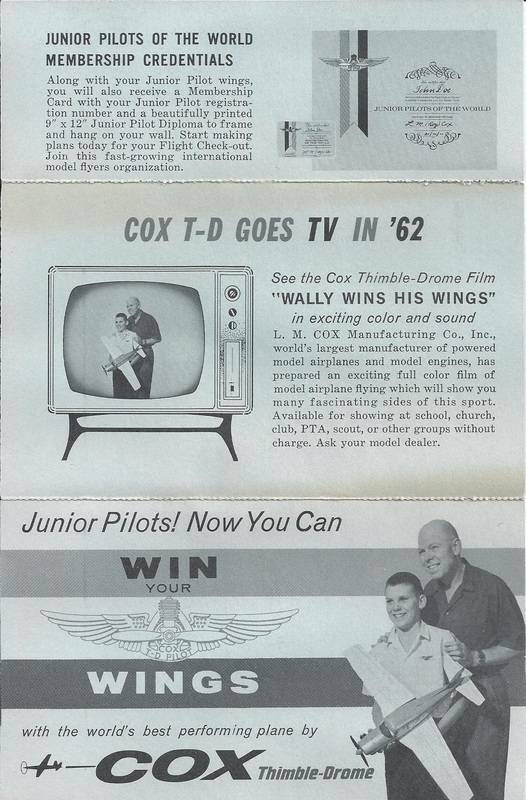 I have to hand it to Cox, I guess you could say those pictures worked like a marketing tool. Using the wrenches as pictures will either distort or burr the cylinders. 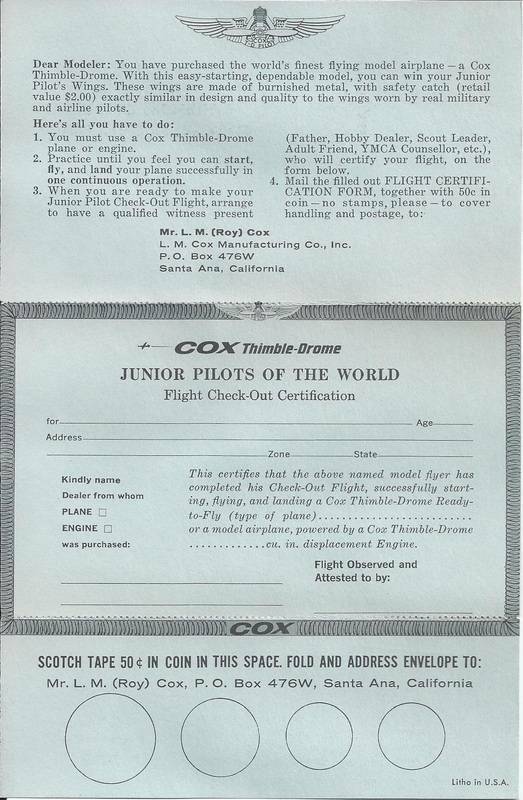 I think that the Cox wrenches have merit. Better than using the dreaded pliers. What was a kid supposed to do, if the cylinder loosened from the case when trying to change a glowhead? Granted; their later design of milling wrench-flats into the top of their cylinders was a better idea. All my cox wrenches are made of so soft metal (calling it steel would be an insult to the steel industry) that their jaws give up way before any damage could be made to a cylinder if used as instructed. That is, the tool is used as shown in the picture, and NOT inserted into the exhaust port and through the cylinder. Maybe older tools were made of a tougher material? I have even thought of having a few tools made from tougher, a little thicker material, water- or laser-cut. I also have a couple of step style cylinders that have the pistons stuck, that was the way those engines arrived to me. Maybe thin and step style cylinders are more easily damaged? Admin wrote: Nice! Do you mind if I add these to the "Instruction Sheets" page? Be my guest. I can also scan them as .pdf if you'd prefer that. Kari, I have actually seen Cox literature that shows using a similar method on Cox .15 cylinders to remove the cylinder. I'll have to try and remember to dig up the instructions that have that. You don't use the glow plug opening, but you do use the collet opening on the wrench to hook the cylinder. Since there's only one slit to the cylinder and the fins are not slotted, that's the only way to get it done.